Though the chanting of the Kol Nidre text is the iconic moment of the evening service on Yom Kippur, the words of this Aramaic legal formula are less important than the dramatic occasion in which the Kol Nidre is the central element. The congregation enters the Sanctuary on that holiest of nights and is stunned to see an empty open ark devoid of Torah scrolls. 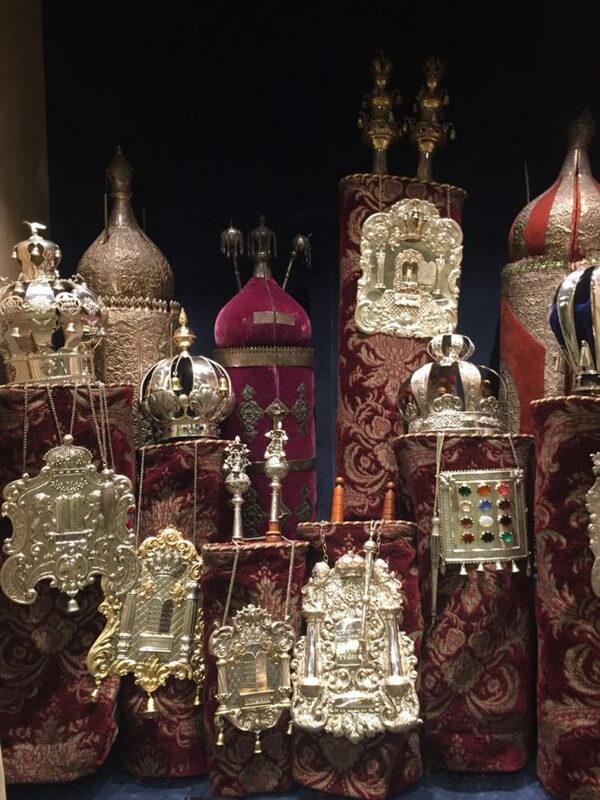 Normally the Aron Hakodesh (The Holy ark) is filled with sifrei Torah – the Torah scrolls are what make the Ark “holy” (Kadosh). Without Torah scrolls the Aron’s meaning changes. In Hebrew, “Aron” is an “ark,” a “closet,” and a “casket.” Looking into an empty Ark is as if we are peering into our own coffins and confronting our limitations and mortality. The High Holidays, however, offer a reprieve. The liturgy reminds us that prayer (i.e. praising and celebrating God and life), teshuvah (i.e. turning and returning to lives of meaning in relationship with others, with Torah, the Jewish people, nature, and God), and tzedakah (i.e. restoring justice into human affairs) are available to us at any time. Despite whatever has drawn us away from our core Jewish values during the year, we can recommit in this season to living our lives with greater dignity and meaning. We can turn our lives around. Fate need not necessarily determine our destiny. We can change, evolve, and grow. We can be elevated and worthy to stand with dignity before God on this holiest of days. The Chassidim teach that if one wishes to walk east when one is walking west, all that’s necessary is to turn around. The primary responsibility of the Jew during the ten days between Rosh Hashanah and Yom Kippur is teshuvah. I have posted here classic rabbinic text for study and contemplation during these days. I wish for everyone the strength and courage to confront that which prevents us from being close to the people we love, friends, community, the Jewish people, Torah, and God. G’mar chatimah tovah. May you be sealed in the book of life. As the chairman of the national board of the Association of Reform Zionists of America, the largest Zionist movement in the United States, I stand proudly with Rabbi Jacobs in his call to Prime Minister Netanyahu to heal this terrible breach between the Israeli government and the non-Orthodox American Jewish community. We American Reform Jews can no more walk away from Israel than we can walk away from our own country when our own political leadership fails us. 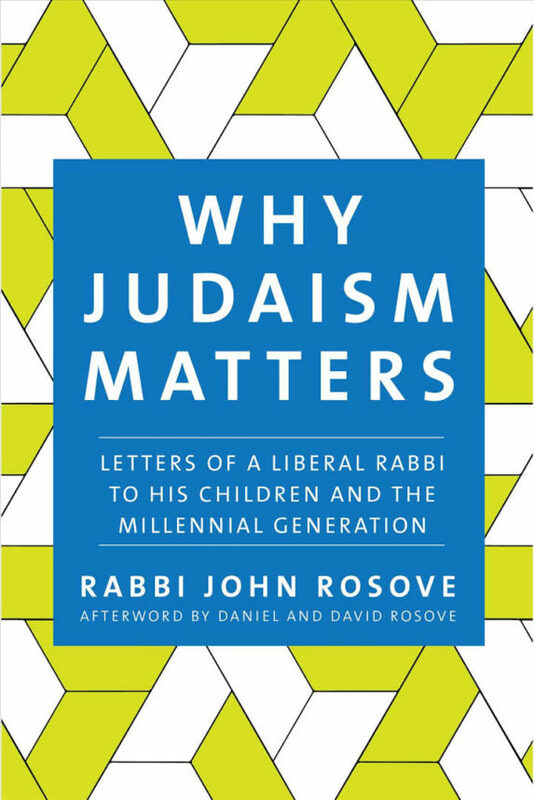 “Why Judaism Matter – Letters of a Liberal Rabbi to His Children and the Millennial Generation” with an Afterword by Daniel and David Rosove is now available for purchase on Amazon.com (publishing date – October 10). This book is a collection of thirteen letters offering a common sense guide and roadmap for a new generation of young men and women who find Jewish orthodoxy, tradition, issues, and beliefs impenetrable in 21st Century society. It is published by Jewish Lights Publishing, a division of Turner Publishing. I have addressed this book of letters to millennials specifically, but this volume is also for their parents and grandparents, the younger generation of college-age Jews, and non-Jewish partners and spouses of Jews who are interested in the possibility of living meaningful and vibrant Jewish lives. I invite you to purchase this book and share it with those you love. “Rabbi John Rosove addresses his intellectual and well-reasoned investigation of faith to his own sons, which sets this book apart for its candor and its ability to penetrate not only the mind but also the heart.” – Matthew Weiner, creator of the AMC series Mad Men, and writer and producer on the HBO drama series The Sopranos. Matthew has earned nine Primetime Emmy Awards. “John Rosove does what so many of us have struggled to do, and does it brilliantly: He makes the case for liberal Judaism to his children. As Rosove shows, liberal Judaism is choice-driven, messy, and always evolving, “traditional” in some ways and “radical” in others. It is also optimistic, spiritual, and progressive in both personal and political ethics. Without avoiding the hard stuff, such as intermarriage and Israel, Rabbi Rosove weaves all of these strands together to show the deep satisfactions of living and believing as a liberal Jew. All serious Jews, liberal or otherwise, should read this book.” – Rabbi Eric H. Yoffie, President Emeritus of the Union for Reform Judaism and a regular columnist for the Israeli daily newspaper Haaretz. “Rabbi John Rosove has given a gift to all of us who care about engaging the next generation in Jewish life. The letters to his sons are really love-letters from countless voices of Jewish wisdom across history to all those young people who are seeking purpose in their lives. From wrestling with God, to advocating for peace and justice in Israel and at home, and living a life of purpose, this book is a compelling case for the joy of being Jewish.” – Rabbi Jonah Pesner, Director of the Religious Action Center of Reform Judaism in Washington, D.C.
“Rabbi John Rosove gets it. Here is a religious leader not afraid to tell it like it is, encapsulating for his audience the profound disaffection so many young Jews feel towards their heritage. But instead of letting them walk away, he makes a powerful case for the relevance of tradition in creating meaningful lives. In our technology-saturated, attention-absorbing age, Rosove offers religion-as-reprieve, his fresh vision of a thoroughly modern, politically-engaged and inclusive Judaism.” – Danielle Berrin, columnist and cover-story journalist for the Los Angeles Jewish Journal, commentator on CNN and MSNBC, and published work for The Guardian, British Esquire, and The Atlantic. “Rabbi Rosove’s letters to his sons are full of Talmudic tales and practical parables, ancient wisdom with modern relevance, spiritual comfort, and intellectual provocation. Whether his subject is faith, love, intermarriage, success, Jewish continuity or the creation of a meaningful legacy, you’ll find yourself quoting lines from this beautiful book long after you’ve reached its final blessing.” – Letty Cottin Pogrebin, writer, speaker, social justice activist, author of eleven books including Debora, Gold, and Me: Being Female & Jewish in America, a founding editor of Ms. Magazine, a regular columnist for Moment Magazine, and a contributor of op-eds in the New York Times, Washington Post, Boston Globe, Philadelphia Inquirer, Toronto Star, and LA Times, among other publications. “If you’re a fellow Reform millennial, give yourself the gift of John’s insights. This book is written in a breezy, gentle, readable style that is welcoming without losing sharp insight. It was so enjoyable and refreshing to read and persuasive without ever being pushy. Rosove managed to do what only a truly worthy slice of kugel or chance viewing of Fiddler has done for me; reactivate my sense of wonder and gratitude about being Jewish. I’m a huge fan of WJM.” – Jen Spyra, staff comedy writer on The Late Show with Stephen Colbert (CBS), former senior writer for The Onion, actress, and stand-up comedian. Jen’s writing has appeared in The New Yorker, The Wall Street Journal, The New York Daily News, and The Daily Beast, and has been featured by The Laugh Factory Chicago’s Best Standup Show Case. “Rabbi Rosove has written a wonderful book, a love letter to his children, and through them, to all our children. Prodigiously knowledgeable, exceedingly wise, and refreshingly honest, Rabbi Rosove has described why Judaism Matters. It should serve as a touching testament of faith, spanning the generations for generations to come.” – Rabbi Ammiel Hirsch, Senior Rabbi of Stephen Wise Free Synagogue in NYC, former Executive Director of the Association of Reform Zionists of America-World Union for Progressive Judaism, author of One People, Two Worlds: A Reform rabbi and an Orthodox rabbi explore the issues that divide them with Rabbi Yaakov Yosef Reinman. “John Rosove’s letters to his sons based on his life, philosophy, and rabbinic work address what it means to be a liberal and ethical Jew and a lover of Israel in an era when none are automatic. He writes in an unassuming personal style steeped in traditional texts as he confronts conflicts of faith and objectivity, Zionist pride and loving criticism of the Jewish state, traditional observance and religious innovation. He is never gratuitous and invites his readers into his family conversation because what he says is applicable to us all.” – Susan Freudenheim, Executive Director of Jewish World Watch, journalist, former managing Editor of the Los Angeles Jewish Journal, and a former editor at the Los Angeles Times. May we recognize our solidarity / with the stranger, outcast, downtrodden, abused, and deprived, / that no human being be treated as “other,” / that our common humanity weaves us together / in one fabric of mutuality, / one garment of destiny. May we pursue the Biblical prophet’s vision of peace, / that we might live harmoniously with each other / and side by side, / respecting differences, / cherishing diversity, / with no one exploiting the weak, / each living without fear of the other, / each revering Divinity in every human soul. May we struggle against institutional injustice, / free those from oppression and contempt, / act with purity of heart and mind, / despising none, defrauding none, hating none, insulting none / cherishing all, honoring every child of God, every creature of the earth. May the Jewish people, the State of Israel, and all peoples in The Land / know peace in this New Year, / And may we nurture kindness and love everywhere. I recommend highly a little book first published in 1898 called “The Majesty of Calmness” by William George Jordan, an American editor, lecturer and essayist of the late 19th and early 20th century. This 62-page treasure-trove of common-sense wisdom reminds me of the Biblical Book of Proverbs and the wisdom literature of the Hebrew Bible. It was written in an elegant prose that exists in classical works. “Majesty of Calmness” can be purchased on Amazon for $4.95. Do yourself a huge favor. Read it once, and then read it again. At the midnight hour after Shabbat that precedes Rosh Hashanah, the Jewish community gathers as the Gates of Heaven begin to open to receive the petitions of forgiveness of the community. 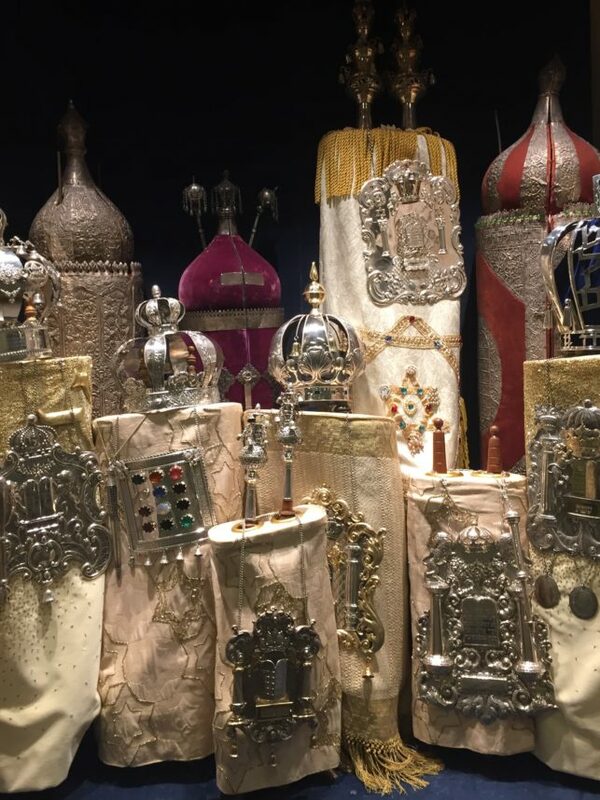 Each year we change our Torah mantles to white symbolically revealing the deepest purpose of these High Holidays, to do Teshuvah, to turn away from an alienated life and to return to our loved ones, community, Torah, one’s own soul, and to God. This is the midnight hour. / The Psalmist said: “At midnight I rose to acclaim you” (116:62). / We, who are his descendants, would follow this tradition. / For midnight belongs neither to today nor to tomorrow. It is a moment alone in time. / It is an interval with a magic all its own. / As we grow weary with the weight of the late hour, / We become introspective, / Concerned with the nature of life; / Especially our own. Time is fleeting. / Midnight becomes tomorrow. / A day is behind us / And the New Year beckons. / How shall we use our days? / What is the meaning of our lives, our goodness, our power? / Shall we use them only for ourselves / Or for the good of others? / This midnight service summons us / to the true purpose of life. Summer is passing. / The days grow shorter. / The sounds and colors of nature, / The stirring of the wind, / Speak to us of changes in the world, in life, / And in a human being’s course on earth. Now is the time for turning. / The leaves are beginning to turn / From green to red and orange. The birds are beginning to turn / And are heading once more towards the south. / The animals are beginning to turn / To storing their food for the winter. For leaves, birds, and animals / Turning comes instinctively. / But for us turning does not come so easily. It takes an act of will for us to make a turn. / It means breaking with old habits. / It means admitting that we have been wrong; / And this is never easy. It means losing face; / It means starting all over again; / And this is always painful. It means saying: I am sorry. / It means recognizing that we have the ability to change. / These things are terribly difficult to do. But unless we turn, / We will be trapped forever in yesterday’s ways. Author of above poem unknown. Nothing has changed in the last month with Trump’s extraordinary refusal to condemn all those on the side of the KKK and Neo-Nazis at Charlottesville. People say Trump isn’t a racist or an anti-Semite. I say that if it walks like a duck, looks like a duck and quacks like a duck, it’s a duck. Read this article in the Forward about the American Jewish community decision concerning a pre-High Holiday call scheduled for this morning with Trump. Our Reform, Conservative, and Reconstructionist movement’s moral decision to boycott this meeting because of Trump’s promotion of the outrageous moral equivalence argument of the haters and those who came to protest the haters. Read the entire article, but note below the historically low level of support in the Jewish community for Trump and his presidency. Only 11% of Reform Jews support Trump. “…. While the Orthodox community is fully on board with Trump’s call, other elements of the Jewish community are strongly opposed to participation. This split reflects the broader political divide within the Jewish community, as seen in this week’s American Jewish Committee public opinion survey. The poll found that 71% of Orthodox Jews approve of Trump’s performance as president, compared with 25% of Conservatives, 11% of Reform, 8% of Reconstructionists and 14% of those identifying as “just Jewish.” Orthodox Jews make up an estimated 10% of the American Jewish community. Where am I? 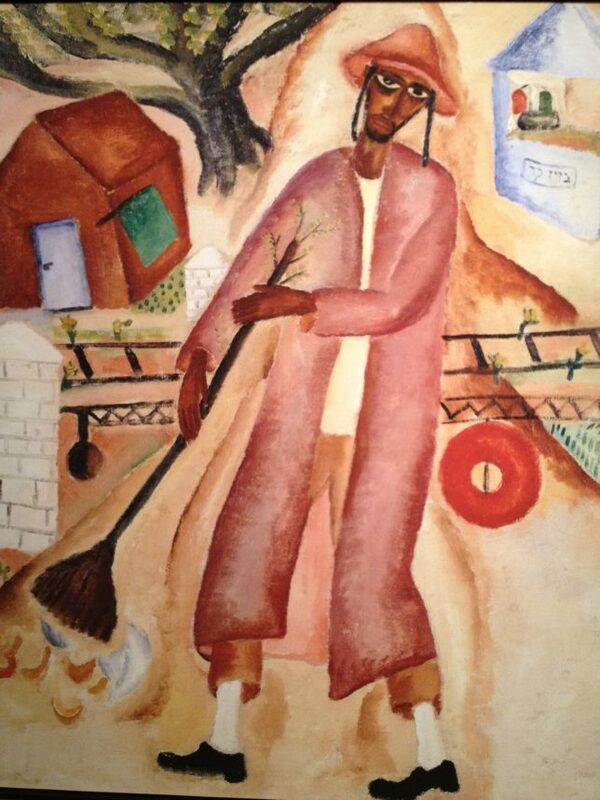 What’s the state of my inner life, my relationships with the people I love, with Judaism and tradition, and with God? How through habit and a lack of will have I strayed from a healthy, integrated, loving, and generous life? Do we recognize ourselves in this Midrash? Though the mitzvah refers to learning Torah its application is far broader. The protagonist lists one hundred and one ways why he can’t learn or find a teacher, mentor or guide to help him grow and change. Are we not like the Jew in the story? Like him, so often we just don’t want to get out of bed nor confront our shortcomings, inadequacies, and failures of will. Like the Jew in the story, so often we’re accustomed to doing things the way we always have done them, even if they’re dysfunctional and self-destructive, and even if they’re the source and cause of our alienation from others and unhappy relationships. Like the Jew in the story, so often we find reasons to avoid change. Like the Jew in the story, so often we’re stubborn. Though there’s comfort in routine, a routine may keep us stuck in the past when we should be living our lives forward. As Chassidic wisdom teaches, if you want to go east but are going west, all you have to do is turn around and take that first step. This is the season of turning, and though changing direction may require an extreme act of will before taking that first step, once we do it, the second step is easier to take and the third easier still. In the tumult of the early months of the Trump presidency and in light of the recent natural disasters brought by Hurricanes Harvey and Irma, many of us have been distracted from Israel’s “matzav – situation” regarding the unresolved Israeli-Palestinian conflict. Yossi Alpher is a long time security analyst who served as an advisor to Prime Minister Ehud Barak’s delegation at the 2000 Camp David peace effort with President Clinton and PA Chairman Yasser Arafat. Alpher writes frequently and is always worth reading as he is clear-sighted, pragmatic, and an astute and informed observer of Israel’s security situation. Could Defeating ISIS Actually Hurt Israel? Today, everything depends on the negative factor, the dual Iranian and ISIS threats.